Job one in the development of the Source Audio One Series overdrive pedals – L.A. Lady Overdrive, Kingmaker Fuzz, and Aftershock Bass Distortion – was to create three great sounding, flexible, and easy-to-use pedals. Out of the box, that’s exactly what they are – plug them in, select from the three onboard overdrive engines and make beautiful music… simple. But there is much more here than meets the eye (and ear) - the truly “Big Idea” behind the new overdrive pedals was to give musicians a second, far deeper, set of options and editing tools with which to craft the perfect tone. This is where the Neuro Mobile App comes in (and the Neuro Hub software editor if you want to go the MIDI route). The Neuro Mobile App is a free download for iOS and Android and it massively expands the possibilities of the L.A. Lady, Kingmaker and AfterShock. Below is a line-by-line explanation of each and every adjustable parameter and function selector included in Neuro Mobile App’s overdrive Sound Editor. Let’s start from the top and work our way down. The first thing to remember is that the Source Audio One Series overdrive pedals feature dual distortion engines. With the two distortion engines it’s possible to cascade overdrives, run them in parallel and mix them together, or configure them so that each distortion engine is routed to its own output (splitting your tones). This is why you will see redundant parameters listed in the Sound Editor – please remember, controls labeled “LEFT” adjust the first drive engine and controls labeled “RIGHT” control the second. VOICE (LEFT) - Each overdrive/fuzz/distortion circuit features a VOICE control that is a gradual timbre adjustment affecting the overall character of the sound. It is essentially a midrange adjustment that sits within the overdrive circuit. It affects the midrange in subtle ways, increasing the VOICE setting above the mid-point provides a midrange boost, whereas decreasing VOICE setting below the mid-point provides a midrange cut. Many different sounds are available using the VOICE control. VOICE FREQUENCY (LEFT) – Adjusts the point in the frequency spectrum at which the VOICE control sits. Moving the VOICE FREQUENCY slider to the right causes the VOICE control to affect higher frequencies and moving it to the left causes the VOICE control to affect lower frequencies. DRIVE (LEFT) – Adjusts the amount of overdrive, fuzz, and distortion. OUTPUT (LEFT) – Adjusts the overdrive engine’s overall output volume. DISTORTION ENGINE (LEFT) - This drop down menu allows you to select from the 40 plus distortion engines available on the L.A. Lady, Kingmaker, and AfterShock. DISTORTION/CLEAN MIX (LEFT) – Adjusts the balance between a clean and distorted signal. Moving the slider all the way to the left is 100% distorted and all the way to the right is 100% clean - all points in between control the blend of the distorted and clean signals. DRIVE PRE/POST BLEND (LEFT) – Here is a little known fact, within each of the pedal’s two drive engines there are two separate drive circuits. The DRIVE P/P BLEND offsets these drive elements often increasing one while decreasing the other to create often very subtle, but sometimes-dramatic differences. The level of affect this control has on the tone varies depending on which drive engine is being edited. DRIVE MAXIMUM (LEFT) – Increases or decreases the level of overdrive or fuzz available to the DRIVE knob. TREBLE LEVEL (LEFT) – Adjusts the higher frequencies of the overdriven tone. By default this shelving filter sits around 10 kHz and functions as a shelf when it is boosted (gain > 0 dB) and a low pass when it is cut (gain < 0 dB). The frequency position of TREBLE LEVEL can also be adjusted with the TREBLE SHELF FREQUENCY slider (see below). BASS LEVEL (LEFT) – Adjusts the lower frequencies of the overdriven tone. By default this shelving filter sits around 100 Hz and functions as a shelf when it is boosted (gain > 0 dB) and a high pass when it is cut (gain < 0 dB). The frequency position of BASS LEVEL can also be adjusted with the BASS SHELF FREQUENCY slider (see below). MID A LEVEL (LEFT) – Adjusts the lower midrange frequencies of the overdriven tone. By default this slider boosts or cuts a peaking filter at 620 Hz. The frequency center point of the MID A LEVEL can also be adjusted with the MID A FREQUENCY slider (see below). MID B LEVEL (LEFT) – Adjusts the upper midrange frequencies of the overdriven tone. By default this slider boosts or cuts a peaking filter at 63 kHz. The frequency center point of the MID B LEVEL can also be adjusted with the MID B FREQUENCY slider (see below). RIGHT ENGINE CONTROLS - The next 12 controls perform - for the RIGHT engine - the same functions described above. VOICE (RIGHT) - See description above. VOICE FREQUENCY (RIGHT) - See description above. DRIVE (RIGHT) - See description above. OUTPUT (RIGHT) - See description above. DISTORTION ENGINE (RIGHT) - See description above. DISTORTION/CLEAN MIX (RIGHT) - See description above. DRIVE PRE/POST BLEND (RIGHT) - See description above. DRIVE MAXIMUM (RIGHT) - See description above. TREBLE LEVEL (RIGHT) - See description above. BASS LEVEL (RIGHT) - See description above. MID A LEVEL (RIGHT) - See description above. MID B LEVEL (RIGHT) - See description above. NOISE GATE SWITCH (LEFT & RIGHT) – Engages or disengages a built in noise gate. The noise gate blocks the entire signal going to your amp when the instrument is not being played. This can be extremely helpful with high gain tones. FILTER GATE MODE (LEFT & RIGHT) – Works similarly to a noise gate but rather than shutting down the entire signal, the FILTER GATE blocks only the frequencies associated with the noise created by the distortion engines - because noise annoys. :-\ When engaged the FILTER GATE has three levels of sensitivity: LOW, MED, and HIGH. NOISE GATE THRESHOLD (LEFT & RIGHT) – When the NOISE GATE is engaged, this slider controls the gate sensitivity. CLEAN HIGH CUT FILTER (LEFT & RIGHT) – Adjusts high frequencies of the clean signal when the pedal is engaged. This is useful for eliminating the higher frequencies of the clean signal when introduced with the DISTORTION/CLEAN MIX slider (see above). TREBLE SHELF FREQUENCY (LEFT & RIGHT) – Adjusts the frequency position of the shelf filter associated with the TREBLE LEVEL controls (see above). The filter is applied to both the LEFT and RIGHT distortion engines. TREBLE CUT FILTER TYPE (LEFT & RIGHT) – By default the TREBLE LEVEL slider (see above) functions as a shelf when boosted (gain > 0 dB) and a low pass filter when cut (gain < 0 dB). This drop down menu allows you to use only one type of filter – a HIGH SHELF or a LOW PASS. TREBLE SHELF SLOPE (LEFT & RIGHT) – Adjusts the slope for the TREBLE LEVEL’s (see above) shelf filter. Choose between LOW, MEDIUM, and HIGH – LOW being a more gradual slope and HIGH a steeper slope. TREBLE BOOST ROLL OFF (LEFT & RIGHT) - Rolls off the very top frequencies of the high shelf filters when the TREBLE BOOST sliders are increased past 0dB. TREBLE BOOST MAXIMUM (LEFT & RIGHT) – Selects the highest point at which the TREBLE LEVEL controls can boost the high frequencies (adjusts LEFT and RIGHT engines simultaneously). In the dropdown menu choose from Odb, +3dB, +6dB, +9dB, +12dB, +15dB and +20dB. By default the TBM sits at +15dB. BASS SHELF FREQUENCY (LEFT & RIGHT) - Adjusts the frequency fulcrum point of the BASS LEVEL control (see above) for both the LEFT and RIGHT drive engines. BASS CUT FILTER TYPE (LEFT & RIGHT) - By default the BASS LEVEL sliders (see above) functions as a shelf when they are boosted (gain > 0 dB) and a high pass when they are cut (gain < 0 dB). This drop down menu allows you to use only one type of filter – a LOW SHELF or a HIGH PASS. BASS BOOST ROLL OFF (LEFT & RIGHT) – Rolls off the very low frequencies of the low shelf filter when the BASS LEVEL sliders are increased past 0dB. MID A FREQUENCY (LEFT & RIGHT) – Adjusts the frequency center point for the MID A LEVEL sliders (see above). This adjustment applies to both the LEFT and RIGHT engines. MID A Q (LEFT & RIGHT) – Adjusts the width of the frequency spectrum adjusted by the MID A LEVEL sliders. A low Q affects a large and gradually declining area of the frequency spectrum surrounding the MID LEVEL center point (think a hill with a long, gradual slope on either side). A high Q affects a small and sharply declining area of the frequency spectrum surrounding the MID LEVEL center point (think the Washington Monument). This adjustment applies to both the LEFT and RIGHT engines. MID B FREQUENCY (LEFT & RIGHT) – Adjusts the frequency center point for the MID B LEVEL sliders (see above). This adjustment applies to both the LEFT and RIGHT engines. MID A Q (LEFT & RIGHT) – Adjusts the width of the frequency spectrum adjusted by the MID B LEVEL sliders. See the MID A Q description for an explanation of a Q control. This adjustment applies to both the LEFT and RIGHT engines. LOW CUT FILTER (LEFT & RIGHT) – Cuts off all frequencies below a certain point. As the slider moves from left to right the point at which frequencies are cut gets higher and higher. This is an especially useful control for tightening up a bass guitar tone. It’s often called a “brick wall filter” and it eliminates very low frequencies that are inaudible to humans but add significant stress to speaker cones and can have an overall negative effect on the tone. BASS/CLEAN KNOB ASSIGN (LEFT & RIGHT) – The BASS knob on the L.A. Lady/Kingmaker Fuzz and the CLEAN knob on the AfterShock Bass Distortion can be reassigned to control any one of a large collection of alternate parameters. Check the dropdown menu for a list of assignable parameters. I/O ROUTING OPTION – We have taken full advantage of the stereo in and out jacks on all of the One Series pedals. And, as mentioned above, the L.A. Lady, Kingmaker, and AfterShock all have dual drive elements, which can be independently loaded with any of the 40 plus drive engines available in the Neuro App. This allows the pedals a number of interesting routing options including internally cascaded overdrives, parallel overdrives mixed to one signal, sending different overdrive tones to each of the two outputs, and more. 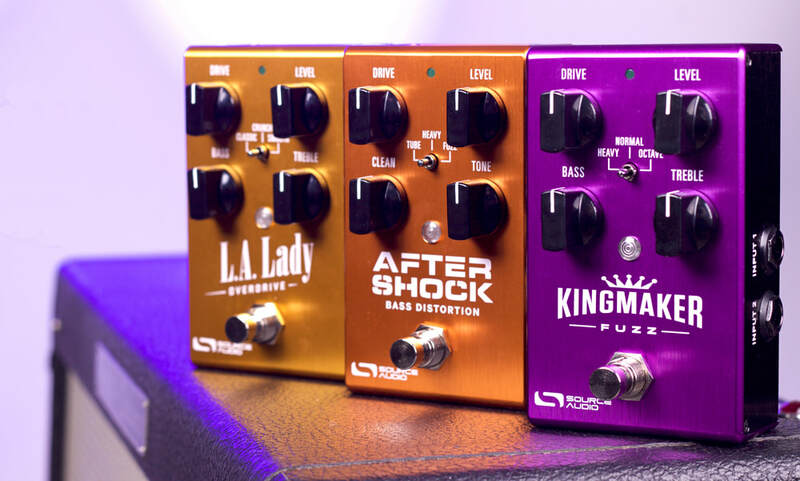 Check out our Kingmaker Fuzz, L.A. Lady Overdrive, and AfterShock Bass Distortion: Signal Routing Options blog for more details. EXTERNAL SWITCH MODE – Selects between a MOMENTARY or LATCHING switch function when using the Source Audio Tap Tempo Switch to externally engage/bypass overdrive engines. A momentary switch affects the change only while the switch is held down. A latching switch affects the change once the switch is pressed and released, then changes back to the original settings when the switch is pressed again. Check the EXTERNAL SWITCH CONTROL OPTION description (below) for more details on external switch control. EXTERNAL SWITCH CONTROL OPTION - With the L.A. Lady, Kingmaker, and AfterShock, it’s possible to use the Source Audio Tap Tempo Switch (available at the Source Audio Online Store) to engage and disengage the dual overdrive engines in a variety of ways. Below are listed the different switching functions and how to use them. RIGHT (CH. 2) OFF/ON – Completely shuts down the output level of the RIGHT drive engine when it is turned off. This is useful when running the two overdrive engines in parallel and toggling between the LEFT engine by itself and mixing together the LEFT & RIGHT engines. RIGHT (CH. 2) BYPASS – Engages and disengages the RIGHT distortion engine, but continues to pass a clean signal when the RIGHT engine is bypassed. This is useful when cascading the two overdrive engines and bypassing or engaging the RIGHT engine via the external switch. LEFT (CH.1) OFF/ON – See the RIGHT engine description above and translate it for the LEFT side. LEFT (CH.1) BYPASS - See the RIGHT engine description above and translate it for the LEFT side. CHANNEL SWITCH LEFT/RIGHT – Enables the external switch to select between the LEFT and RIGHT drive engines. This function will completely shut down the dry signal of the distortion engine being bypassed so it’s not a good idea to use it when cascading the distortion engines, because it will completely shut down your guitar signal. Always run your distortion engines in parallel when using this EXTERNAL SWITCHING OPTION. BACK – Navigates back to the top menu. FILE MENU – Contains options for saving and sharing presets as well as editing preset descriptions. BURN – Allows the user to upload (“Burn”) a preset directly to any of the pedal’s 6 available toggle switch positions. SEND ALL – Sends every Neuro App parameter position from the SOUND EDITOR to the pedal. 3 Crunch Tube - Our own distortion, not based on any particular sound. It’s a more aggressive tube distortion. 26 TS 9001 - Ibanez TS 808? If you have additional questions, please feel free to email us for tech support at contact@sourceaudio.net.